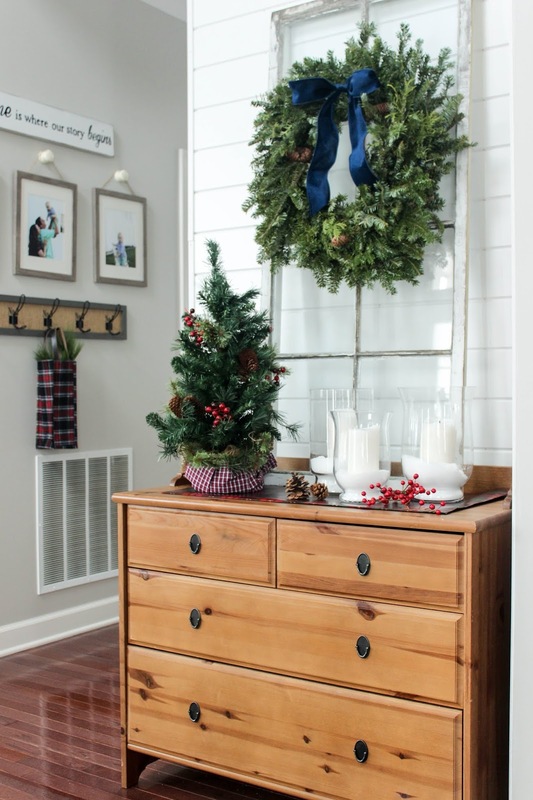 'Tis the season for decking our halls! 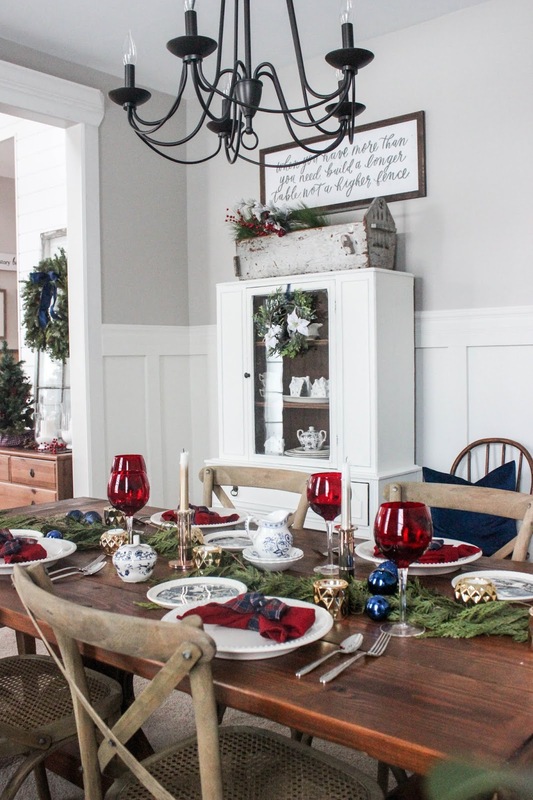 I'm excited to invite you into our home today for our first Christmas tour of the year! Mother Nature just dumped a few inches of snow on the Chicagoland area, so it officially feels like the holidays are here. 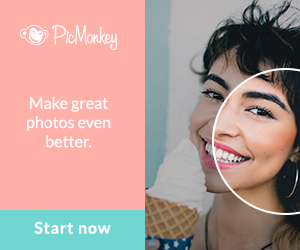 Even more exciting is that I'm joining a group of talented ladies who are also opening their doors to you, so make sure when you leave our home to take a gander over to their tours as well (I'll link to them at the end of this post to make it nice and convenient for you) I promise you won't be disappointed! As a side note, I'll also be sharing with the Jennifer Rizzo Holiday Housewalk! 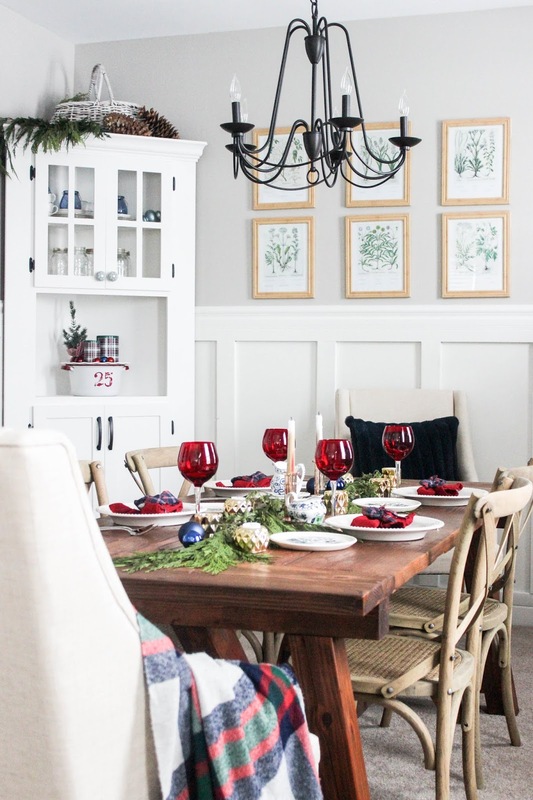 If you're looking for a TON of Christmas inspiration, check it out! For today's tour, I'll be starting at the front of our house and will share more rooms over the course of the next few weeks, so make sure to stop back in! If you're new here, I'm Jennifer, and I live in the western subs of Chicago with my hubby, 2 littles (a 5 year old and soon-to-be 18 month old) and our new and slightly crazy puppy, Milo. 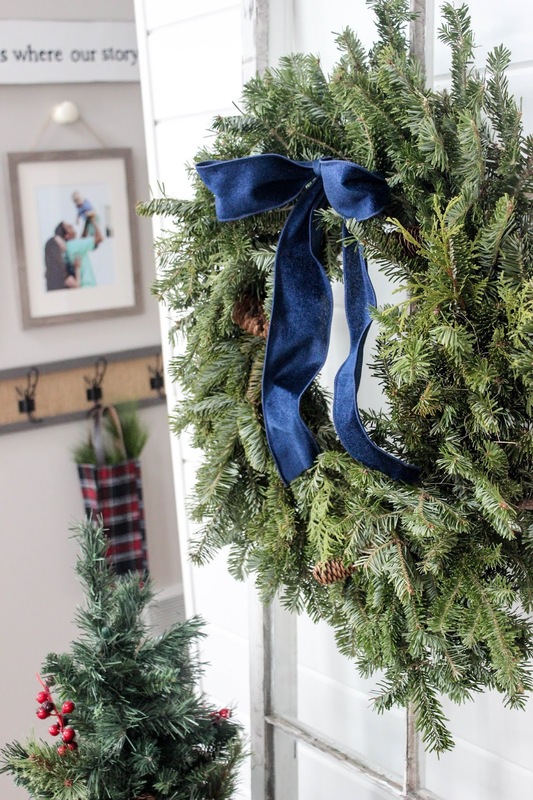 I love trying to add character and charm to our boring, builder-grade home through budget-friendly decor and DIY projects. So glad to have you here today! Now enough rambling, let's start the tour, shall we? Our home opens directly into a two-story foyer area, which is probably my favorite space in the house to decorate! 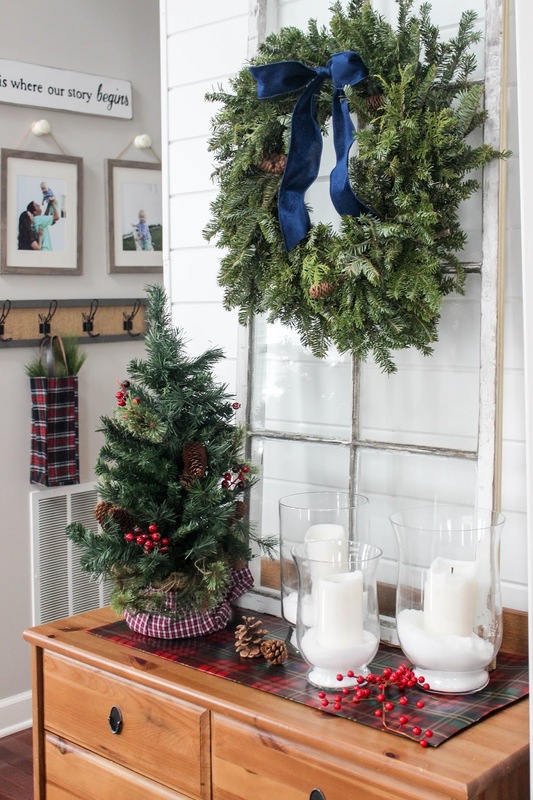 Every change of the season, I switch out the wreath on the old farmhouse window. 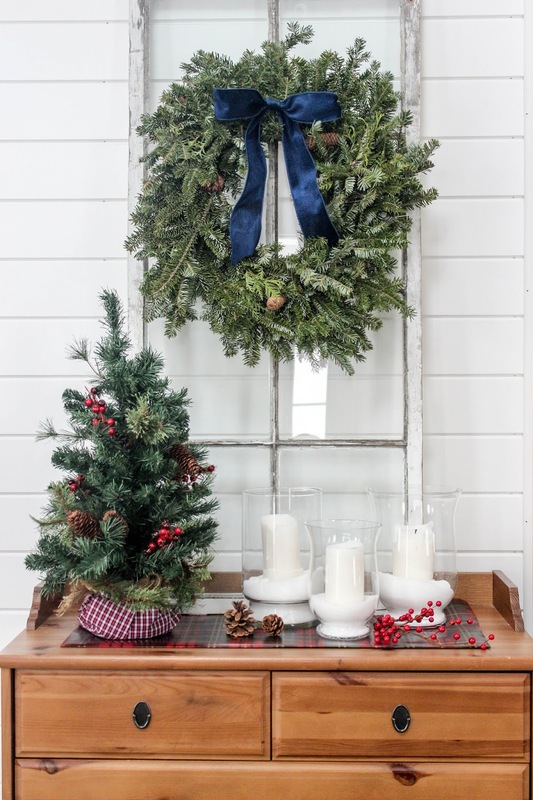 I love grabbing my Christmas greenery from Trader Joe's because it's all so reasonably priced. Blue velvet ribbon helped spruce it up a bit and ties in nicely with my red and blue holiday color scheme. Can we talk about my choice of colors for a moment? I was super, duper nervous about this color combo! 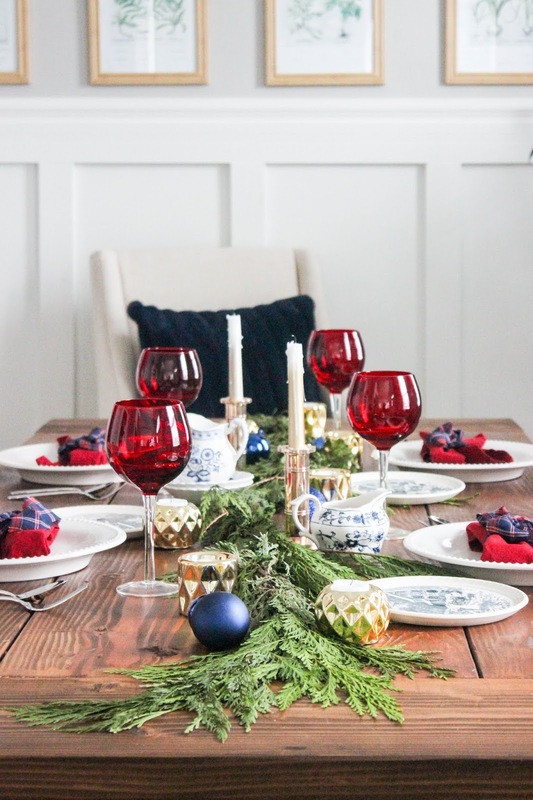 I didn't want it to look like Fourth of July had exploded all over my house but for those of you have followed DN for awhile, you know I love me some blues (check out last year's blue and metallic Christmas) and this year I was really yearning to add back in some red, so here we are! 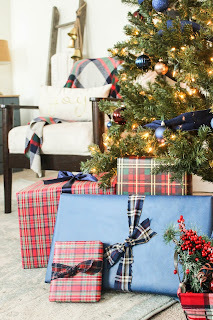 Adding touches of tartan, plaid, and small doses of gold to the red and blue theme were my way of keeping this from going all patriotic on us! The runner on the dresser is actually wrapping paper. You want to know another secret? The tree skirt on the little tree is a kid's plaid shirt I wrapped around it. 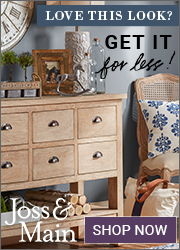 That's one of my favorite bargain tips! 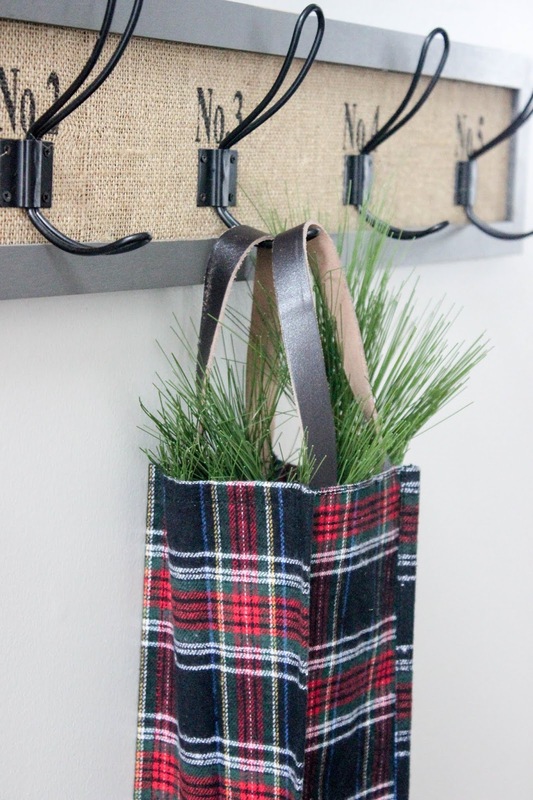 Hit up your local thrift stores for cheap, plaid shirts and then cut them up and use them to decorate. I'll share through out the tour other ways that I incorporated them. A good looking wine gift bag from T.J. Maxx makes for a nice accessory on our wall hooks and they're great for holding and displaying greenery. I've come to the conclusion that garland table runners are THEE best thing ever! 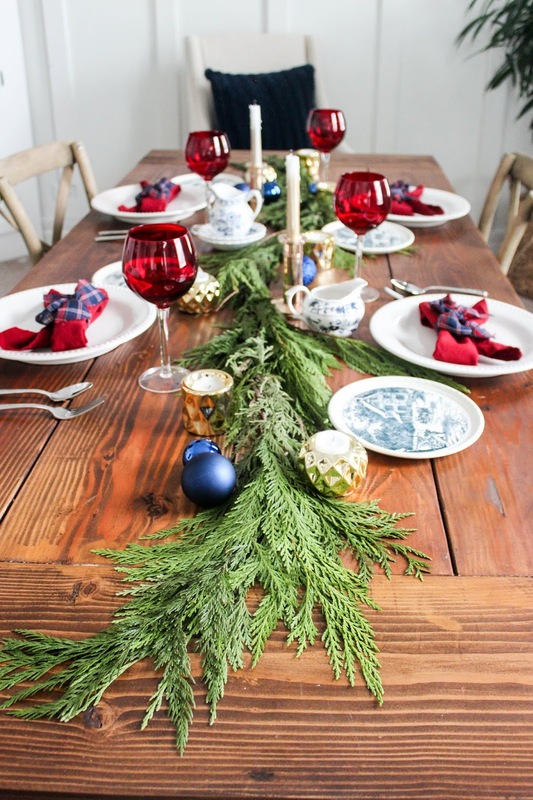 I swear, no matter your tablescaping skill level, throw a strand of fresh garland on your table and it instantly makes you look like you know what you're doing. Another fun way to up your table decorating skills; napkin folding. I decided to challenge myself to try something new and decided to give these bow napkins a try. They were super easy and I love how they turned out! I couldn't find tartan or plaid ribbon in my colors anywhere so I tore up some more of those thrift store shirts and used those to tie around the napkins. Way cheaper than a spool of ribbon! This was the first Christmas with our new corner cabinet that we built and I'm still trying figure out how to decorate it. 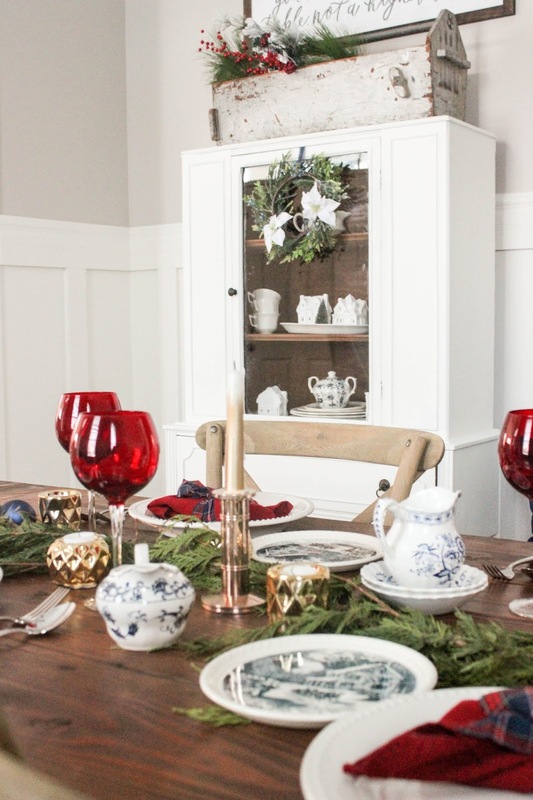 In the mean time, it houses some of our china and my favorite "25" antique Christmas pot I picked up last year. 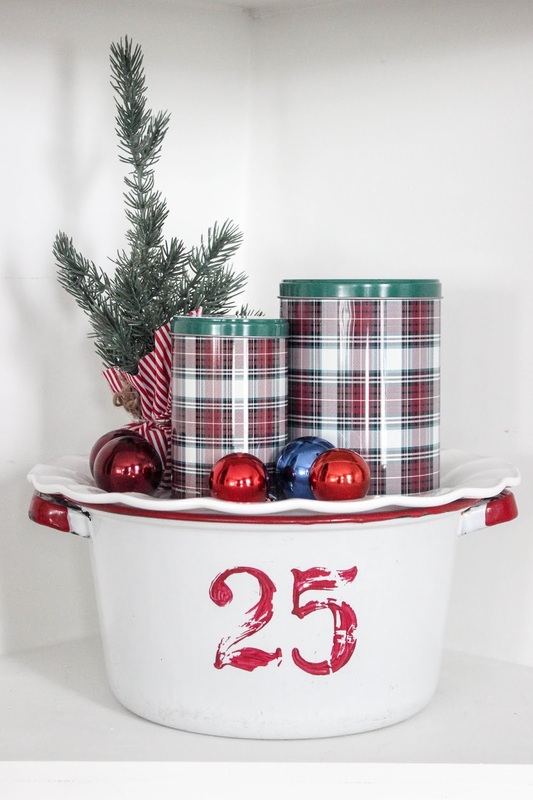 I set a white pedestal cake tray inside of it to display the tartan tin cans and mini Christmas tree. 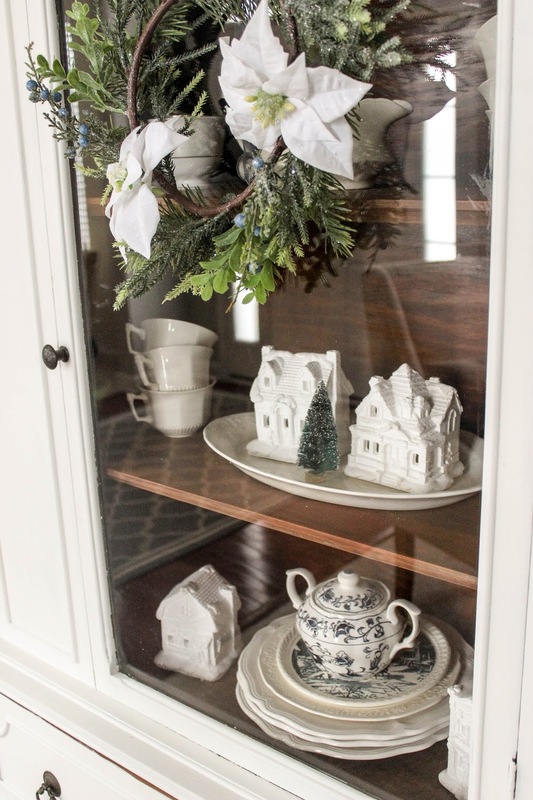 Our dining room hutch got dressed up for the season as well. I kept it pretty simple with these little white houses that I found at the Salvation Army. 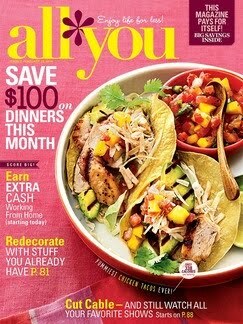 Just 97 cents a piece! Can't beat that. 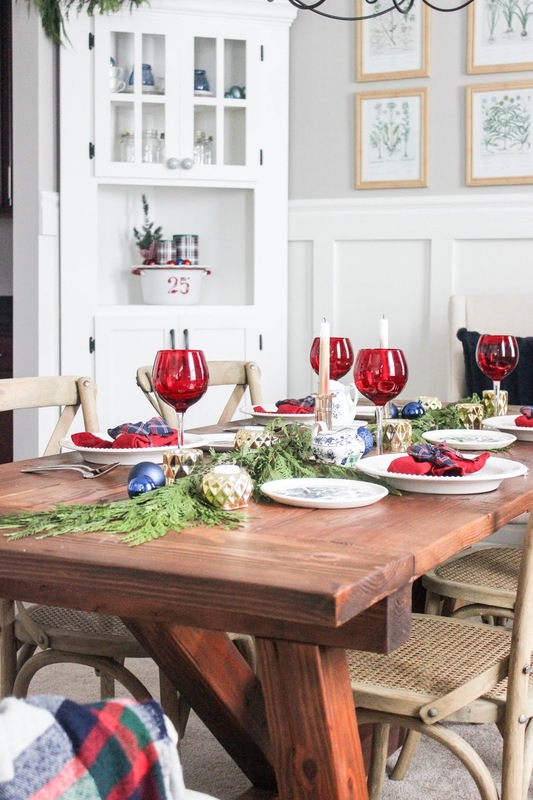 I was thrilled that besides those houses, thrift store shirts, and the cedar garland, everything else in the dining room I shopped from my home. Thank you so much for touring my holiday home! I can't wait to share the rest of the house with you (Editor's Note: See part 2 of the tour here!) Wishing you and yours a season of joy and happy memories! Don't forget to stop by the other tours. They are all so talented and everyone's style is different, which I love! 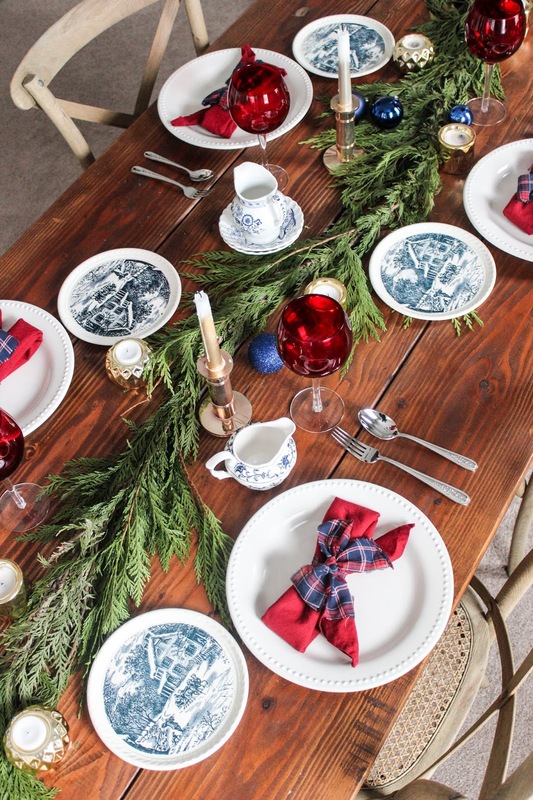 You're bound to gather lots of Christmas inspiration! 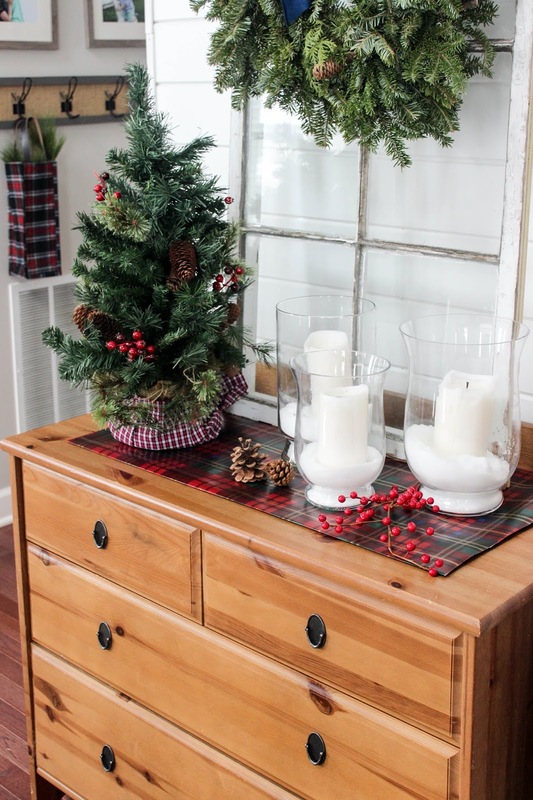 Now available-Part 2 of our Christmas Home! I just love this blue, red and green. This looks like something out of a magazine. Beautiful tour girl! I love the unusual color combo! I too am mad for plaid.